The Cubs continue to scout the Yankees’ dominant late-game trio of Aroldis Chapman, Andrew Miller and Dellin Betances, reports George A. King III of the New York Post. After sending Jason Parks to the Bronx to observe the troika earlier this month, the Cubs had a three-man contingent – including pro scouting director Jared Porter and pro scout Steve Boros – take in the performances of the lights-out relief aces over the past two days. Chapman, Miller and Betances combined for six shutout, one-hit innings during that span, also adding nine strikeouts against zero walks. The Yankees have won three straight and are at 37-36 – just 2.5 games out of an AL Wild Card spot – so they certainly don’t look like surefire sellers at the moment. That could change prior to the Aug. 1 trade deadline, of course. If the opportunity arises, Red Sox president Dave Dombrowski would be willing to make a trade with the archenemy Yankees, he told Brian MacPherson of the Providence Journal. Specifically, the Red Sox would have interest in the Yankees’ top relievers, notes MacPherson. The only trade the AL East rivals have made since 1997 came when the Sox dealt shortstop Stephen Drew to the Yankees in 2014, but that lack of history wouldn’t stop Dombrowski from trying to swing a deal with Brian Cashman. “If they’re in it and we’re in it, probably the odds are longer,” Dombrowski said in regards to a potential move. Boston, which possesses the top Wild Card position in the AL, is currently four games ahead of New York. After Trevor Rosenthal yielded three earned runs and failed to record an out in a losing effort Friday, Cardinals manager Mike Matheny informed the right-hander Saturday that he’s out as the Redbirds’ closer, tweets Derrick Goold of the St. Louis Post-Dispatch. For now at least, the Cardinals will go with a combination of Seung-hwan Oh, Kevin Siegrist and Jonathan Broxton in save situations, Matheny said (Twitter link via Jenifer Langosch of MLB.com). Rosenthal took the reins as the Cardinals’ closer in 2014 and proceeded to save 93 of 102 opportunities and log a 2.65 ERA over a two-season, 139-inning span. This year has been a different story, though, as Rosenthal has offset excellent strikeout (13.5 per nine innings) and grounder rates (56.7 percent) with a 7.88 BB/9 (up from 4.34 from 2014-15) and a soaring home run rate. The 27-year-old’s ERA sits at an unsightly 5.63. The Cardinals announced that they’ve signed right-hander Jonathan Broxton to a two-year contract to return to the St. Louis bullpen. Broxton, a Jet Sports client, will earn a $7.5MM guarantee and receive full no-trade protection, per reports. Last year was rough in terms of bottom line results — the veteran ended with a 4.62 ERA — but that doesn’t tell the whole story. For one, Broxton’s peripherals showed that he’d been a bit unlucky leading up to a mid-season trade from the Brewers to the Cardinals. 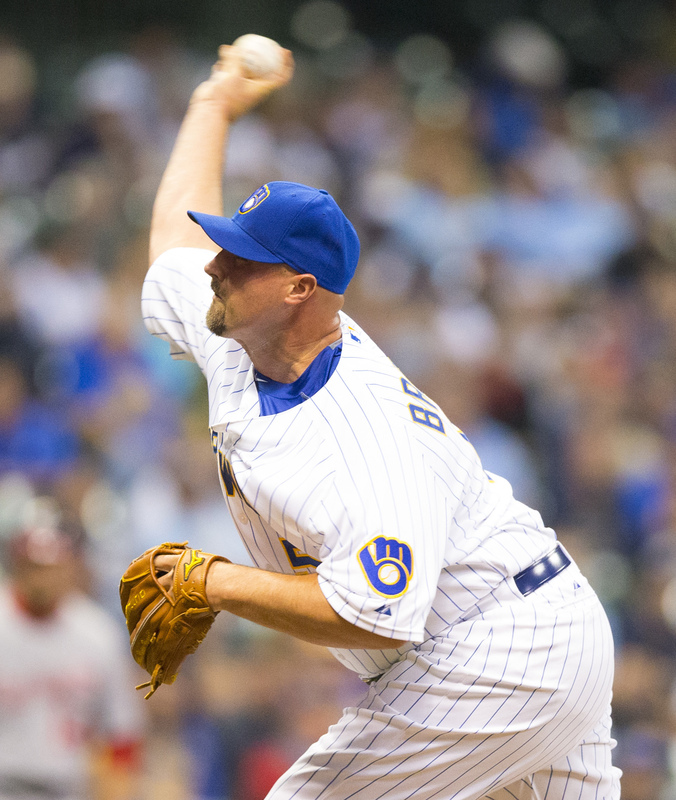 For another, Broxton produced a 2.66 earned run average over the 23 2/3 frames he logged with St. Louis. In the aggregate, Broxton showed that he’s still plenty capable of providing valuable innings from the pen. Though his walks actually trended up in the latter part of the year, Broxton managed to strike out more than a batter per inning for the first time since way back in 2010. Then, there’s the fact that FIP (3.65), xFIP (3.24), and SIERA (3.15) all saw him as a quality producer. St. Louis already bet on Broxton once with the mid-season trade, and now it’s doubled down after initially declining a $9MM option over the former closer. It seems likely that the veteran could have achieved a greater guarantee elsewhere, given the fact that his deal includes the kind of no-trade protection that we don’t typically see in a short-term deal (let alone one for a reliever). But the match worked last year, and the Cards obviously felt another sturdy arm was needed in the pen. Broxton will join Jordan Walden and Seth Maness as right-handed set-up options in front of closer Trevor Rosenthal. KMOX’s Tom Ackerman first reported (on Twitter) that the agreement was in place. Devan Fink first tweeted the contract details. 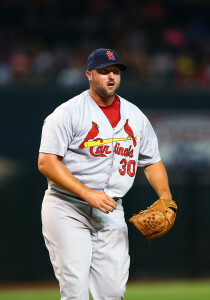 The Cardinals announced on Monday that they have declined their $9MM club option on right-hander Jonathan Broxton. He’ll instead be paid a $2MM buyout and hit the open market, where he’s free to sign with any club. Additionally, the Cardinals announced that they have outrighted shortstop Pete Kozma off the 40-man roster along with catchers Ed Easley and Travis Tartamella. Kozma, 27, received 111 plate appearances for the Cardinals in 2015 but batted just .152/.236/.152. Known for his defensive wizardry, it’s been two seasons since Kozma was the team’s regular shortstop. That 2013 campaign proved to be the only in Kozma’s five-year career in which he’s received regular at-bats, to this point. The former first-round pick batted just .217/.275/.273 that season, which was weak enough for him to grade out as replacement level despite being one of the game’s better defenders at shortstop. The 29-year-old Easley and 27-year-old Tartamella each made their big league debuts in 2015, though Easley went 0-for-6 and Tartamella just 1-for-2 in their brief cups of coffee. Easley is a lifetime .289/.360/.420 hitter in nearly 300 games at the Triple-A level and has enough minor league experience to qualify as a free agent. Tartamella, too, has the minor league service to become a free agent, though he doesn’t have the offensive track record that Easley carries. Tartamella is a .229/.276/.289 hitter in his Triple-A career, though he’s regarded as a solid defender behind the dish. 2:10pm: St. Louis will receive $3MM in the trade, Joel Sherman of the New York Post tweets. But $2MM of that is contingent upon the Cardinals declining Broxton’s 2016 option, meaning that Milwaukee will effectively be picking up $1MM of Boxton’s remaining 2015 tab. 11:13am: The Cardinals have officially acquired reliever Jonathan Broxton from the Brewers, as Jerry Crasnick of ESPN.com first reported on Twitter. Outfielder Malik Collymore is going to Milwaukee in the deal, and there will be an unknown amount of cash headed with Broxton to St. Louis (via Adam McCalvy of MLB.com, on Twitter). Broxton represents yet another turnaround reliever candidate acquired by St. Louis in recent years, including Steve Cishek just days ago. The Cardinals had been rumored at times to be seeking starting pitching depth, but ESPN.com’s Jerry Crasnick notes on Twitter that the team may have elected instead to deepen its pen. That should not only provide additional options as the club waits for the return of Jordan Walden, but will also reduce the burden on its rotation. The 31-year-old owns an unappealing 5.89 ERA on the year, but his fastball is still averaging better than 94 mph and his peripherals are more encouraging. Broxton has compiled 9.1 K/9 against 2.5 BB/9 and a 49.5% groundball rate. SIERA grades his contribution at a promising 2.89 ERA estimation. Broxton is playing in his eleventh big league season, and he’s racked up 576 innings of 3.25 ERA pitching along the way. He no longer posts quite the gaudy strikeout tallies of his youth, and has had some rough seasons along the way, but all said it’s an impressive overall body of work. Of course, another significant issue with the veteran is his contract. Broxton is owed $9MM this year as well as a $1MM buyout on his $9MM option for 2016. It remains unknown how the financials will shake out, but St. Louis will likely receive some money along with the right-hander. For the Brewers, moving salary was undoubtedly the primary motivation in striking the deal. The club has now shipped out a variety of veteran players, adding prospects and saving money along the way. It still has several possible trade pieces in its holster, including first baseman/DH Adam Lind and closer Francisco Rodriguez. In Collymore, Milwaukee adds a 20-year-old outfielder who has played exclusively in the low minors over three years in the St. Louis organization. He’s only compiled 347 total plate appearances in that span, putting up a .286/.360/.429 slash, though he has not hit well in limited time in the Appalachian League this season. His stronger output in Rookie ball last season did earn him the 27th ranking on Baseball America’s pre-season Cardinals prospect list. BA says that he has some upside and raw power, but he has yet to show much in-game pop (at least in terms of home run tallies) and is still somewhat without a home on the defensive side of the equation. The Phillies asked the Brewers for a “top prospect” in return for closer Jonathan Papelbon if the club was to pick up a big piece of the remainder of his deal, Ken Rosenthal of FOX Sports reports (in a piece we cited earlier this morning). In response, Milwaukee broached the idea of sending Jonathan Broxton back to Philadelphia to help balance the cash, a concept that did not gain traction (and which Rosenthal argues made little sense for either club). Those talks are now dormant, per Rosenthal. That would appear to take the Brewers out of the picture for Papelbon at this point. As Rosenthal explains, the entire episode also demonstrates the broader difficulty the club is facing in moving Papelbon. While a spring injury could always shake up the market, it increasingly appears (as others have suggested) that waiting until the summer to deal might represent the best option for the Phils. The Red Sox have plenty of leverage in their pursuit of Phillies lefty Cole Hamels, writes Peter Abraham of the Boston Globe. That’s because “even the second-best deal [Amaro] can get for Hamels from the Red Sox is likely better than he can get elsewhere,” as Abraham puts it. Even taking on most of the Hamels deal is going to leave plenty of value left to be accounted for in any trade scenario — another topic that Steve and I discuss — but Abraham suggests that the gap might be bridged by a package fronted by lefty Henry Owens and including several other top prospects not named Betts, Swihart, or Rodriguez. Francisco Rodriguez also spoke to Haudricourt about his future, and unlike Weeks, who seems resigned to being elsewhere, K-Rod hopes to return to the Brewers in 2015. “I definitely know where I want to be,” he said. “I want to be here. But it is not my decision.” As Haudricourt points out, Milwaukee’s trade for Jonathan Broxton and his $9MM salary next season could give Broxton the inside track for the closer’s gig and push K-Rod out of the picture. The team additionally saw a breakout performance from Jeremy Jeffress and expects to have Jim Henderson returning to health. Huntington also touched on the timeline of Gregory Polanco’s promotion to the Majors, noting that he wishes Neil Walker wouldn’t have gotten hurt. Had Walker remained healthy, Josh Harrison wouldn’t have had to shift to second base — a move that necessitated the promotion of Polanco, according to Huntington. “I hated [promoting Polanco]. I really did,” said Huntington. As the GM explained, the team thought Polanco was “borderline ready,” but he also stated: “There’s a reason why that Triple-A level exists, why most guys who have had success at the Major League level have experienced Triple-A beyond 250 at-bats.” Polanco got off to a blistering start in his first two weeks but has batted just .204/.275/.324 since and started just three games in September. The Reds announced that they have acquired right-handers Kevin Shackelford and Barrett Astin from the Brewers to complete the Jonathan Broxton trade. Cincinnati originally sent Broxton to Milwaukee in exchange for a pair of players to be named later on Aug. 31 — the last significant deal before the deadline for newly acquired players to be eligible for postseason play. Shackelford and Astin ranked 21st and 22nd, respectively, among Brewers prospects heading into the 2014 season, according to Baseball America. However, neither player cracked Milwaukee’s top 20 list on MLB.com’s midseason list. The 25-year-old Shackelford is the more advanced of the two prospects, as he reached Double-A this season and posted a combined 3.69 ERA with 5.2 K/9 and 2.7 BB/9 in 70 2/3 relief innings between that level and Class-A Advanced. BA felt that he should have reached Triple-A, if not the Majors, this season in their preseason scouting report, but Shackelford’s Double-A struggled (4.86 ERA in 50 innings) may have held him back. BA noted that he can touch 97 with his fastball and gets whiffs on his slider, making him a potential late-inning reliever. They did, however, note that the slider can be inconsistent — something he’ll likely look to improve upon in 2015. However, the fact that he’ll turn 26 next season and has yet to reach Triple-A suggests that Shackelford is far from a sure thing to end up as a consistent piece in the Cincinnati bullpen. Astin, 23 next month, was the Brewers’ third-round pick in 2013. He served as Arkansas’ closer as the team pushed to the College World Series, and BA noted that while he may not be durable enough to remain a starter, he could move quickly as a reliever. Indeed, Astin posted a 5.55 ERA as a starter this season in 96 2/3 innings, but he turned in a terrific 2.27 ERA in 26 relief innings. Overall, he posted a 4.96 ERA with 6.0 K/9 and 2.7 BB/9 in 121 1/3 innings at Class A. While neither prospect is particularly highly regarded, GM Walt Jocketty picked up a pair of arms that could potentially help his bullpen within the next two years, and he shed more than $11MM in salary in the process. To this point, Broxton has done his job for the Brewers, firing four shutout innings with four strikeouts and no walks, helping to bridge the gap to closer Francisco Rodriguez. Phillies GM Ruben Amaro says to expect “significant changes” to the team’s roster, MLB.com’s Todd Zolecki writes. “I think we need it,” says Amaro. “I think we need it because what we have on our roster right now is not working.” The timing of Amaro’s comments is a bit odd, given that he spent both the July and August deadlines mostly declining to trade veterans (although he did ship John Mayberry Jr. to the Blue Jays yesterday). Perhaps, though, there are big moves coming in the offseason. Last week, former GM Pat Gillick took over as interim team president while David Montgomery went on medical leave. Amaro says that the Phillies will not replace him or manager Ryne Sandberg while Gillick is running the team. Here’s more from the National League. Mets manager Terry Collins is surprised that there wasn’t more interest in pitcher Bartolo Colon before the August deadline, Marc Carig of Newsday reports. “I was a little surprised that there wasn’t more activity,” says Collins. “But I’m happy he’s still here.” Colon cleared waivers despite his respectable performance this season, probably due primarily to his $11MM salary in 2015. The returns of Matt Harvey and Bobby Parnell and improvements by Lucas Duda would suggest that the Mets are trending upward, but the David Wright and Curtis Granderson contracts could become a problem, Adam Rubin of ESPN New York writes. Wright is signed through 2020, and his .264/.324/.364 line this season is way off his career norms. Granderson, meanwhile, hasn’t hit well in the first season of his four-year deal. If those players don’t improve, and if the Mets don’t significantly increase spending, they’ll be stuck paying a large percentage of their team payroll to two relatively unproductive players. Jonathan Broxton was surprised the Reds traded him to the Brewers, Tom Haudricourt of the Journal Sentinel reports. “I didn’t see it coming at all, especially with an extra year (remaining on his contract) in there,” Broxton says. Broxton will make $9MM in 2015, plus a $2MM buyout or a $9MM mutual option in 2016. He will pitch in the eighth inning for the Brewers, Haudricourt writes. The Brewers’ September call-ups will likely include players who aren’t already on their 40-man roster, Haudricourt tweets. That means they’ll have to make moves involving players already on the 40-man. The Brewers have already selected the contract of catcher Matt Pagnozzi, moving Jeff Bianchi to the 60-day DL.